Eindhoven has been a bit behind foodwise. For years there were little healthy hotspots to be found. Luckily things are changing! Below I’ve listed my favorite healthy hotspots in Eindhoven. Hopefully I’ll soon be able to expand the list and add more veggie friendly food spots! Looking for hotspots in other cities in The Netherlands? Click here. Onder de Leidingstraat is a deli meets lunchroom meets take-out in the hippest area of Eindhoven Strijp-S. The old Philips factories are now being used as hip shops, creative spaces and new restaurants. My favorite is Onder de Leidingstraat. They serve breakfast all day (Gluten free granola! 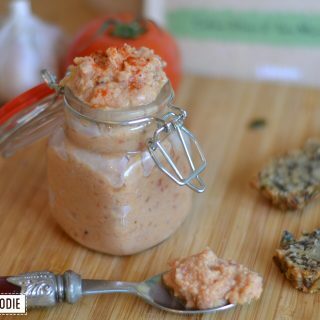 Vegan chia pudding! 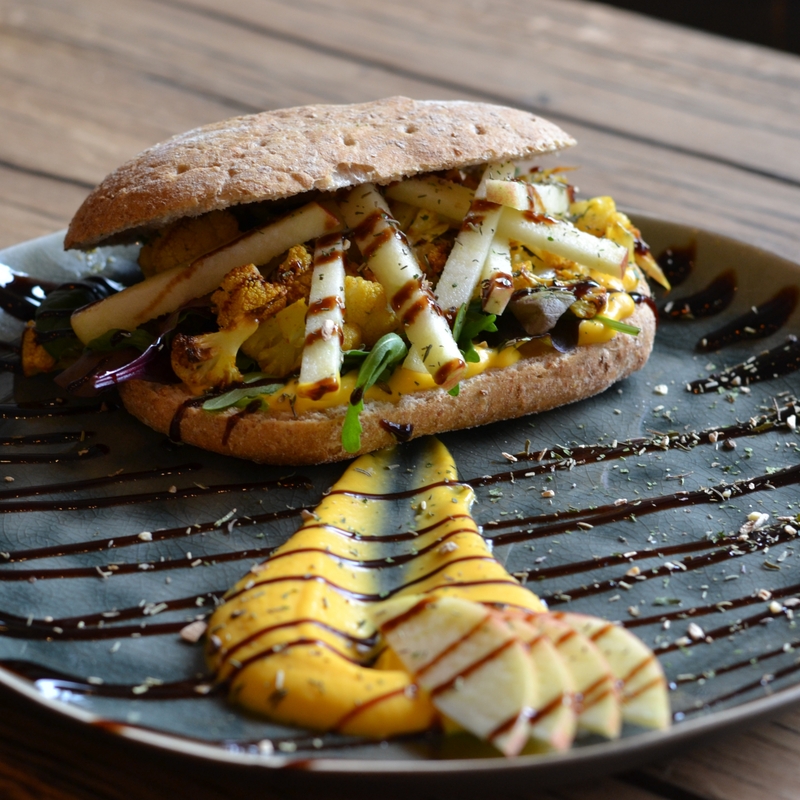 ), have delicious salads and a wide range of sandwiches. 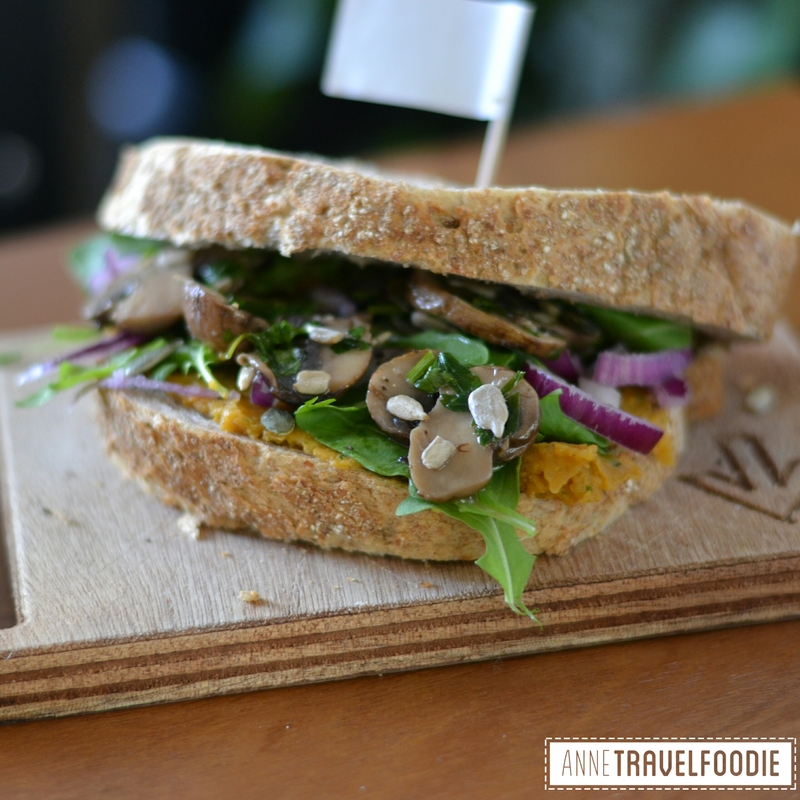 They have two vegan sandwiches on the menu, including the homemade pumpkin spread and mushroom sandwich pictured above. They also have a small ‘supermercado’ where you can buy many healthy products from small independent brands. The Happiness Cafe is a great name for this cafe, because it makes you very happy! It’s right across the street from Usine and serves all day breakfast, salads, sandwiches and homemade sweets. They have many vegetarian options and even a few gluten free and vegan options. Especially the latter is quite unique in Eindhoven where many cafes still serve the usual ‘meat, fish or cheese’. 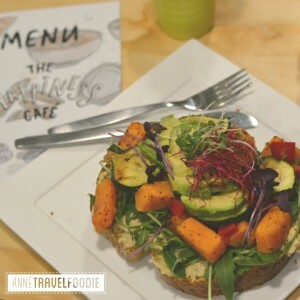 Just look at the delicious vegan sandwich with hummus, avocado and pumpkin they have! I can also recommend the vegan salad with tempeh and the homemade raw pastries. Looking for something sweet? 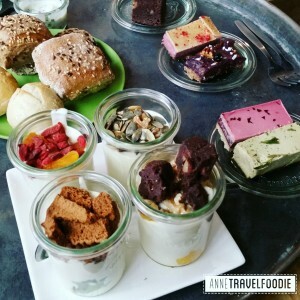 Check the Happiness Bakery for a (vegan) high tea! 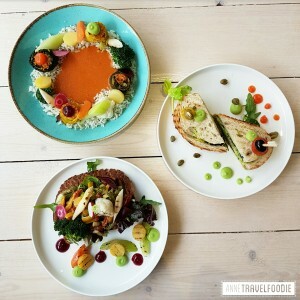 Bij Albrecht is run by a young couple; he’s an experienced chef and she’s a nutritionist specialized in natural food. 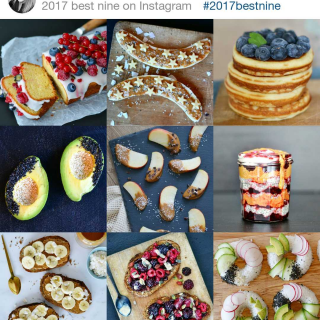 They started By Albrecht with a mission to have a restaurant with a minimal footprint and to inspire a people for a vegan lifestyle. They sure have inspired me! 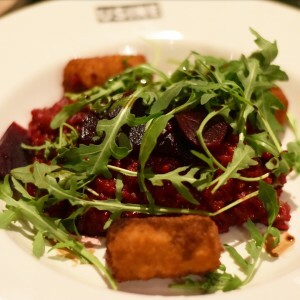 They have many delicious vegetarian and vegan dishes on the menu. 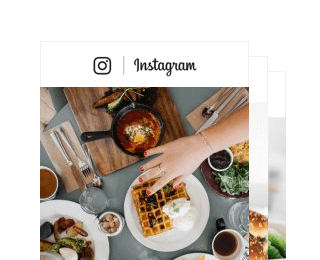 They’re open for dinner and offer an exclusive plant based food experience! 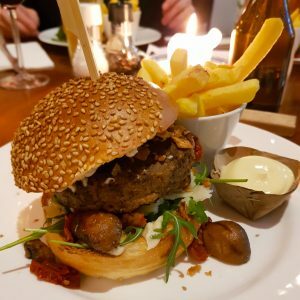 Click here for all my vegan favorites in Eindhoven. Zwart Wit Koffie (Black White Coffee) is a great place for a good cup of coffee or tea. They also have a short but good food menu. Just a couple of items to choose from but two of them are vegetarian and they both taste really good. You’ve got a veggie breakfast with avocado, poached egg and cheese and a sourdough bread sandwich with roasted cauliflower, apple, pumpkin cream and balsamic. It’s around the corner from Bij Aalbrecht so it might be your favorite neighborhood! 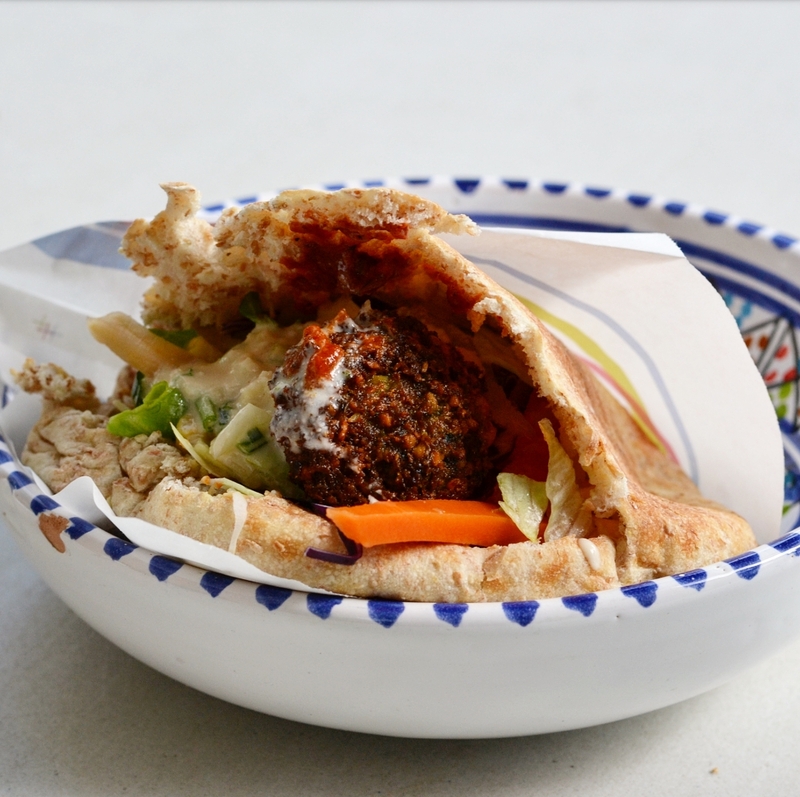 There are probably quite a few places where you can get falafel in Eindhoven, but there are a few reasons why I recommend this one in particular. First of all they have whole wheat pita bread. I think they’re so much tastier and healthier than white bread! Second of all the owner is super friendly. He makes you feel relaxed and takes good care of you. And last but not least: they have many vegan options! They even have several vegan desserts including a date-nut cake and vegan baklava. EMMA is a restaurant, bar and patisserie in the city center of Eindhoven. It’s open since October 2017 and is located on the Nieuwe Emmasingel (hence the name EMMA). 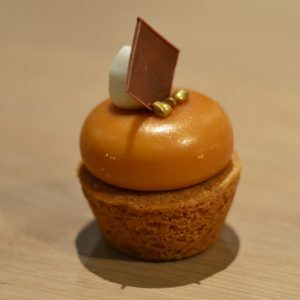 It’s a really unique place because of the concept to have a restaurant, bar and patisserie all in one place. EMMA is housed in a spacious premises with walls covered with street-art style paintings from Iwan Smit and their own indoor greenhouse. You can read more about EMMA on this page. Waffelicious is the perfect place to satisfy your sweet tooth. They serve folded waffles, bubble waffles and ‘freak shakes’. 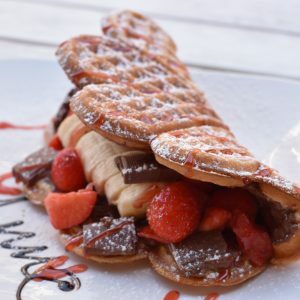 After you’ve chosen if you want a folded waffle or a bubble waffel, you can choose your own spread like Nutella, Speculoos or peanut butter. Then you choose your fruits like apple, kiwi or pineapple. Their toppings will make you drool; amongst others they have Kinder Bueno, Ferrero Rocher, Maltesers and Oreo cookies. Still hungry? You can add a scoop of ice cream! They also have a vegan waffle that tastes delicious! I had one with vegan chocolate spread, banana, strawberries and vegan chocolate chunks. 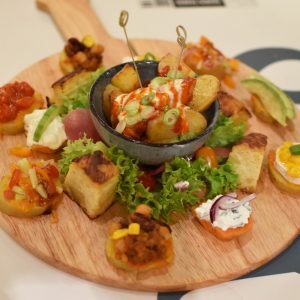 Miss Paddle is a flammkuchen and local beer café in the city center of Eindhoven. 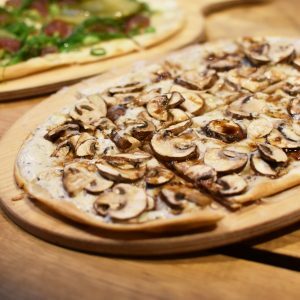 You can enjoy flammkuchen for lunch and dinner here. They have all kinds of varieties of which 4 vegetarian and even 1 vegan flammkuchen. I’ve tasted almost all the vegetarian flammkuchen by now and I can tell you that they’re all delicious! Restaurant De Restauratie is located in the train station of Eindhoven. It is a great place for a lunch, light snack, meal or pastry when you’re meeting up with someone or when you’re waiting for your train. De Restauratie has a beautiful interior that fits in perfectly with the old grandeur of the train station but also has a modern vibe. On the menu you’ll find all sorts of lunch dishes like sandwiches and soups. They also have 4 different ‘croques’. This French version of a grilled cheese sandwich with bechamel sauce will make sure you’re not hungry anymore! 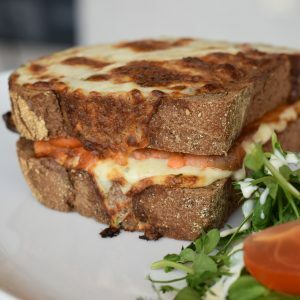 Besides the classic Croque Monsieur and Croque Madame (with a fried egg), they also have a Croque Saumon with smoked salmon and a Croque Veggie with mozzarella and tomato salsa. Also nice: they have vegetarian ‘worstenbroodjes’! Living room cafe Anne&Max has started in Haarlem and now has quite a few restaurants all over the Netherlands. At Anne&Max they serve fresh and homemade dishes with as many organic products as possible. Their sandwiches are made with organic sourdough bread and they get their cheese from an organic family-owned cheese farm in Kinderdijk. 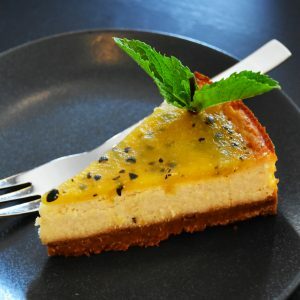 Especially for the Anne&Max location in Eindhoven, Taarten van Janssen has created a vegan passionfruit cheesecake. Click here to see more pictures of Anne&Max in Eindhoven. I told you how Strijp-S is the upcoming area in Endhoven, the downside is that it’s quite far away from the city center. Usine on the other hand is right in the middle of the centre (just like the Happiness Cafe), it’s close to the central station and has a big parking lot which makes it super easy to reach. The menu has many meat options, but they do have a great vegetarian lasagna and my favorite: a quiche with goat cheese, pumpkin, sweet potato and mushrooms. Bad news for the vegans; you won’t find many options here. Restaurant Vane is located on the 13th floor of the NH collections hotel in the city centre of Eindhoven. Vane is lead by topchef Casimir Evens, who worked at 2 Michelin star restaurant Pastorale in Belgium. The views during dinner are amazing when the sky is dark and the city is beautifully lit. 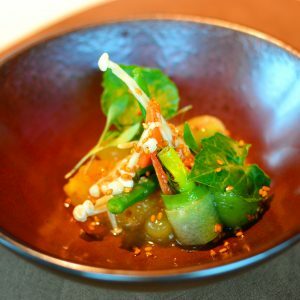 Pictured is a vegetarian starter that I enjoyed; it’s homemade atjar served with avocado cream and wasabi. 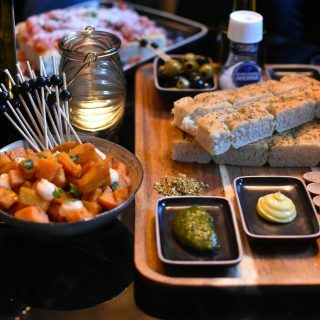 Read all about Vane and the NH collections hotel Eindhoven city centre on this page. 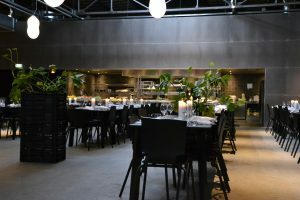 The Kazerne is a restaurant meets exhibition space. They started with a pop-up restaurant with exhibition during the Dutch Design week a few years ago. It was such a success that in 2014 they opened restaurant De Kazerne. The building used to be a garage for garbage trucks and it still has a rough touch to it. The interior is beautiful with grey walls, black furniture and bright green plants. Master chef Carlos Blankers (former chef of Graham’s Kitchen in Amsterdam) develops new dishes every two weeks. He always works with seasonal products and there are always great vegetarian options as well. The Downtown Gourmet Market is one of the most popular food spots in Eindhoven. At this (mostly) indoor food hall there are several stands where you can order your food and you can sit down and enjoy it at one of the many tables in the middle part. I’ve listed all the vegetarian options at the Downtown Gourmet Market on this page. You don’t get round pizza’s at Sugo, but Pizza al Taglio, a rectangular shaped pizza of which you’ll get a (also rectangular shaped) slice. They cut the slices of with scissors when you order them. When you’ve picked your favorite flavors they warm them up for you in their ovens. 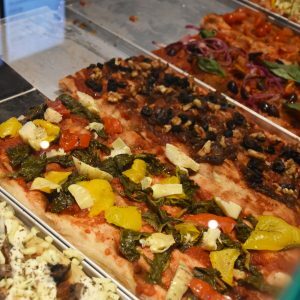 What I like about Sugo Pizza, and what makes them different than other pizzeria’s, is that they have many vegetarian and several kinds of vegan pizza’s. Click here to read more about Sugo Pizza. Pand P is a creative premises formally known as Plaza Futura. 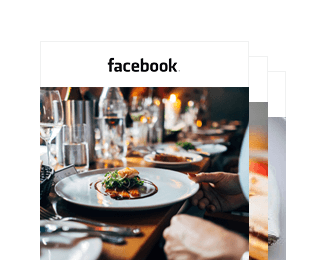 The restaurant area is open for lunch and dinner and is very convenient when you’re going to see a show at the Parktheater as it’s within walking distance. They have several good vegetarian options on the menu like a spinach ricotta tortellini or the vegetarian mushroom burger pictured above. The cheesecake dessert is delicious (but quite filling, so if you’re not a big eater you might want to share it). As the name already says, they sell yogurt. 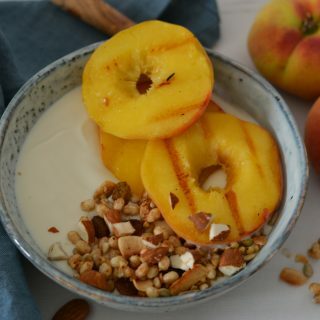 You can choose your own yogurt (all organic, and there’s also vegan option) with your own toppings, or go for one of the combinations that they have on the menu. You can also order a picnic or reserve a high tea. And as you can see on the picture, the high tea is delicious! There’s also a Yoghurt Barn in Utrecht, Den Bosch, The Hague and Amsterdam. Click here for my favorite food spots in other cities in the Netherlands.